Tractor has Newer Briggs and Stratton 16hp OHV engine installed. Fully serviced and ready to cut. 42" 2-blade Cutting Deck With a 42" deck, you will be able to get into tighter spots than larger decks but still quickly cover the wide open areas. Washout Port The deck washout port is a convenient way to clean the bottom of the deck - maintaining optimum airflow for high performance. Two-Year Limited Warranty* All Toro LX series tractors are covered by a two-year limited consumer warranty. 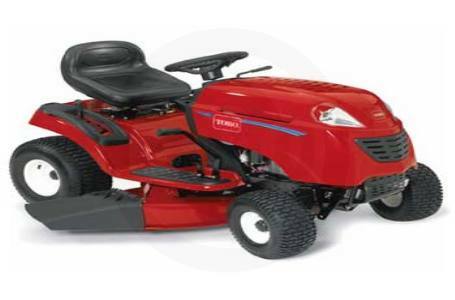 Premium Engines At Toro, we take great care to match engine power capacity with the mower design. Each LX model features a powerful engine that has been tested with the specific mower configuration for optimal performance. We stand behind the performance of every product that carries our brand. You would expect nothing less from the leader in lawn care. Automatic Drive with Cruise Control Continually vary your mowing speed or set the cruise control and enjoy the ride! Cast Iron Front Axle Provides extended life and durability. KeyChoice™ System Toro's KeyChoice reverse operation system improves safety during operation in reverse without diminishing performance. Height of Cut (Inches) 1.5" - 4"
Twin and Triple Baggers Twin baggers have a 6.5 bushel capacity and are optional for all LX models except the LX500, which has the option of using a 10-bushel capacity tripple bagger. Mulch Kit Install a mulch kit on your machine and drive the nutrient rich mulch back into your turf for a healthier lawn. 42" Two-Stage Snowthrower Old man winter has finally met his match. Throw snow up and out of your way with this high-performance two-stage snowthrower. 46" Front Blade Move dirt, snow or landscape rock with this handy front mounted blade. 17 CU. FT. Poly Cart Quickly move material from point A to point B with this extra large dump cart. 10 CU. FT. Poly Cart Transporting material is easy with this large dump cart. Stake Side Kit Stakesides allow you to quickly add capacity to your cart to help carry lightweight bulky materials. Lawn Sweeper Keep your lawn looking clean and neat with a lawn sweeper. Broadcast Spreader A broadcast spreader will help you fertilize your lawn in record time. Spike Aerator Improve the health of your lawn with an aerator. Dethatcher Makes dethatching even large lots quick and easy.